Facebook likes have immense power. I started following Queen of Hearts as pictures of friends wearing really cool funky sarees showed up on my timeline. 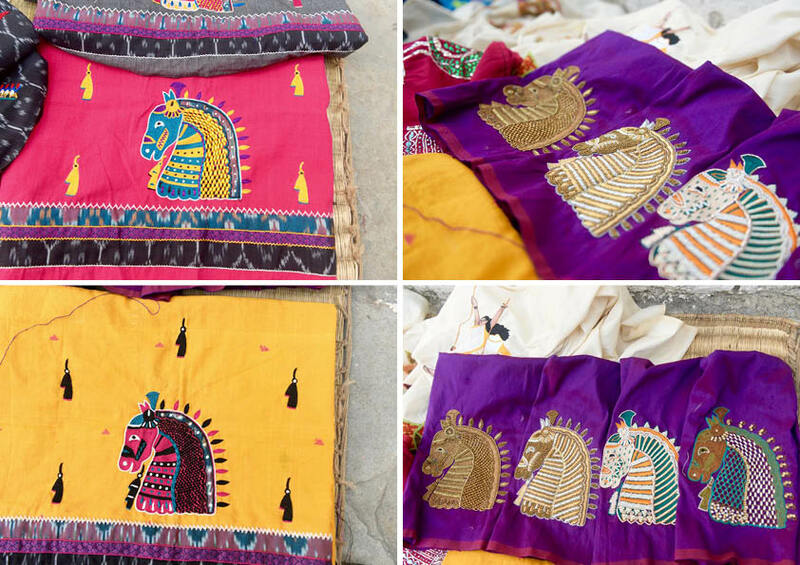 I would drool at the horse block printed and embroidered blouses and the owl saree or the little elephant with balloons or the bicycle saree. 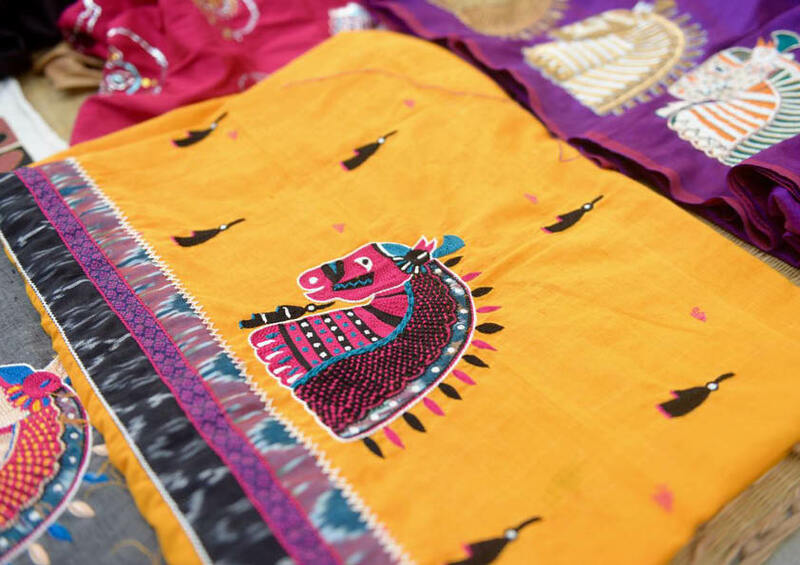 If you looked carefully, the base of the sarees were gorgeous traditional weaves and prints that were overlaid and embellished with contemporary motifs. Her inspiration came from the simple idea that the sarees she designs must build on traditions, giving the saree a modern and funky avatar. 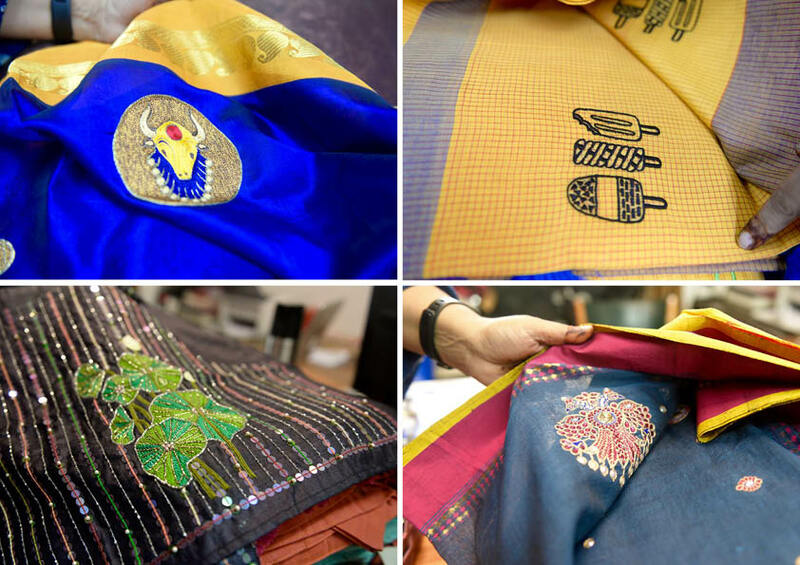 As the grand daughter of a textile mill-owner, Deepa Mehta has a sense of textiles and fabrics like no other. 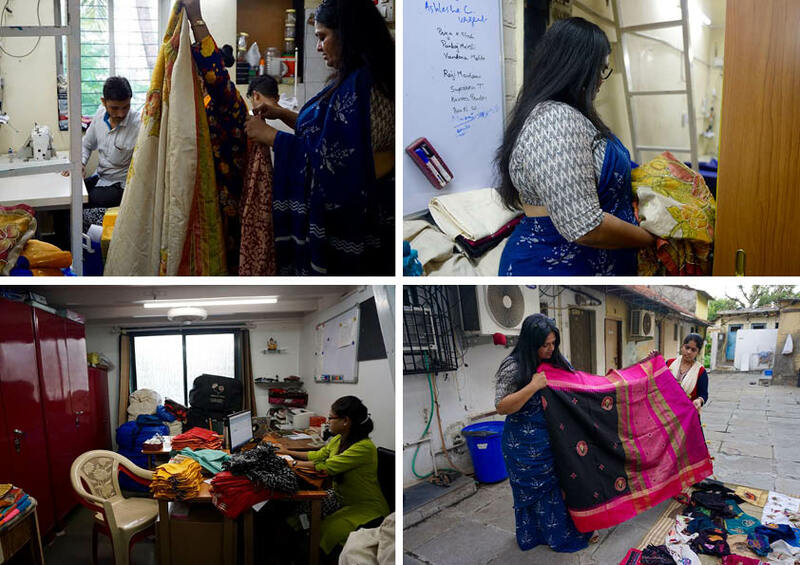 Her business model is to only sell online, thus her sarees have traveled all over the globe. I reached out to Deepa to better understand her process and her inspiration in creating a successful brand around sarees. 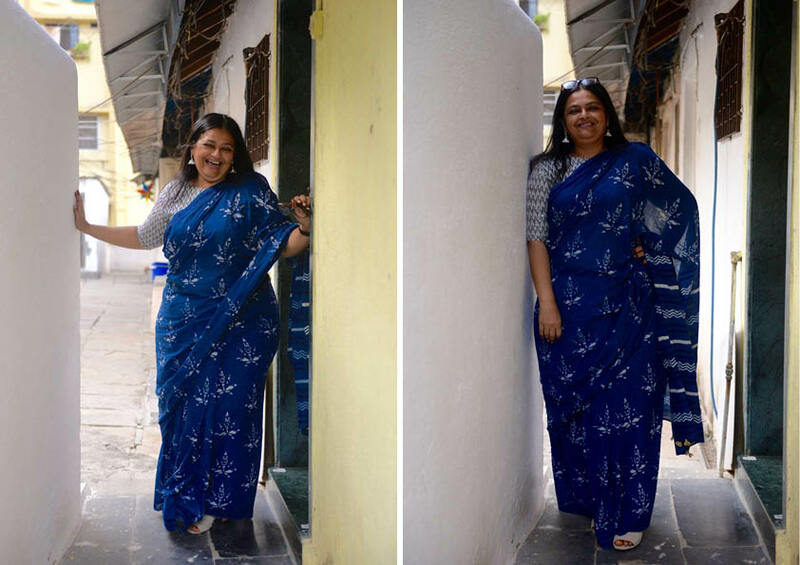 Her motto is to have a lot of fun while wearing sarees and to revive the sarees especially in the minds of young folks who may resist/ reject them. What are your earliest memories wearing a saree? I wore the saree for the first time just as a wrap around thing. I was three years old, when I started playing with my mom’s sarees. However, I wore a saree for the first time in college at the saree festival. How often do you wear a saree? 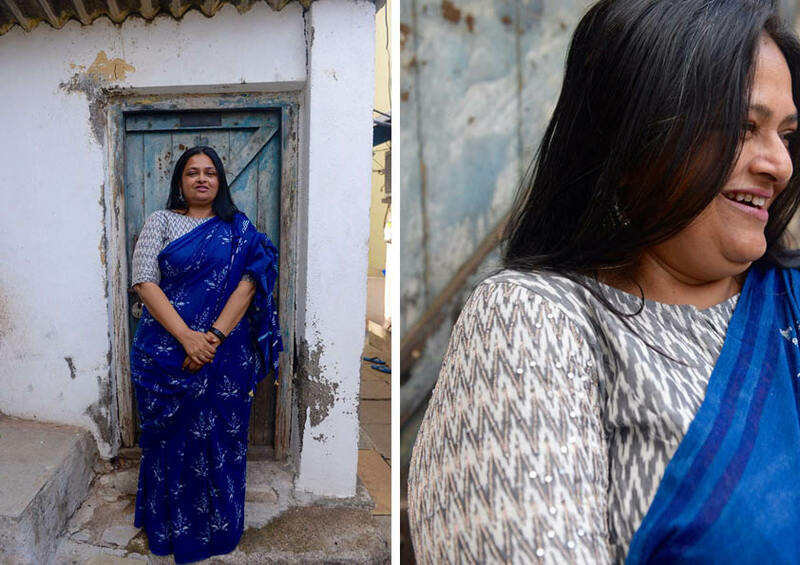 I have gone through phases when I have not worn a saree for years when my kids were growing up. I have a lot of sarees from my mom and aunts. I have always bought sarees whether I wear them or not. 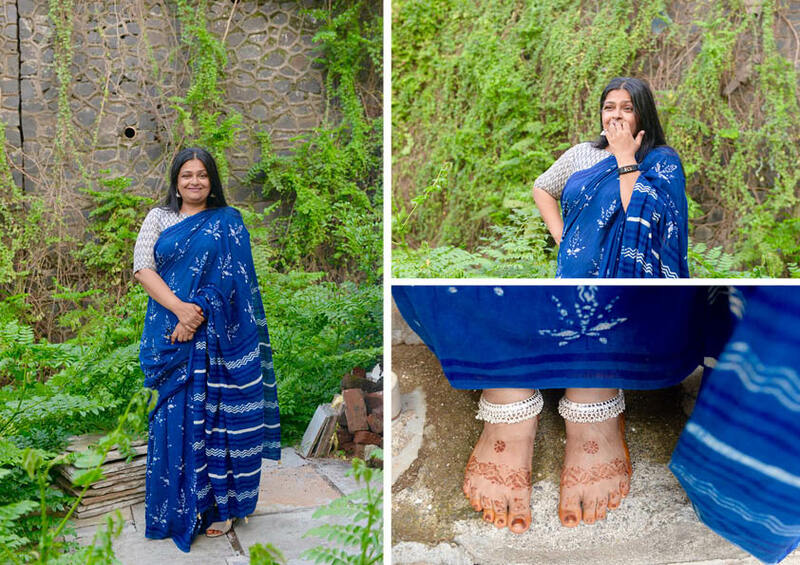 And I went through phases when I wore a saree two to three times a week. Even here when I’m designing, I don’t wear a saree. It is not that it is uncomfortable, but I like wearing other things too. So what do you usually wear when you work? I have this standard kurta, I wear it with Chinese collar pockets. The sleeves have to be short. I don’t like long sleeves. I like folding the sleeves, and I like shoulder lapels and pockets like a men’s kurta. So my alternative next favorite thing to wear is a men’s kurta. So when do you wear a saree? When I am in the mood to wear a saree. It is not for an occasion necessarily. What do you look for when you are wearing a saree? Comfort, the cloth has to feel comfortable on my skin. I’ve worn nylon sarees, in the rain. They are fun too. Colour and texture is important, too. When you said nylon saree, I imagined a bright gaudy fluorescent saree. Yeah! I have those. I have sarees with zari, which I have bought from the flea market in Goa. I have that taste too. Sometimes not just these muted tones, but something dhinchak. I make sarees. I develop cloth. I started making sarees as my 5th profession. I like cloth. I currently run Queen of Hearts and I make sarees in it. India makes the best cloth ever, and in one lifetime one cannot explore all the craftsmanship and possibilities of the country. We make art on cloth. The best ways to express the art is on a 5.5 meters long cloth. I am not interested in tailoring dresses. I like to develop cloth. I can work with someone who designs clothes, as long as I develop the cloth. What do you mean by developing cloth? I started with embroidery, I love the technique. I am tired of the same motifs, I am tired of the paisleys etc. They have not changed the block patterns or weave patterns for hundreds of years. I started QOH, because my daughter said: “Mom make sarees that I would wear”. I always reworked my sarees for her to wear. She likes more edgy clothes. I started QOH four years back and my brother joined in after a year to take care of the logistics. 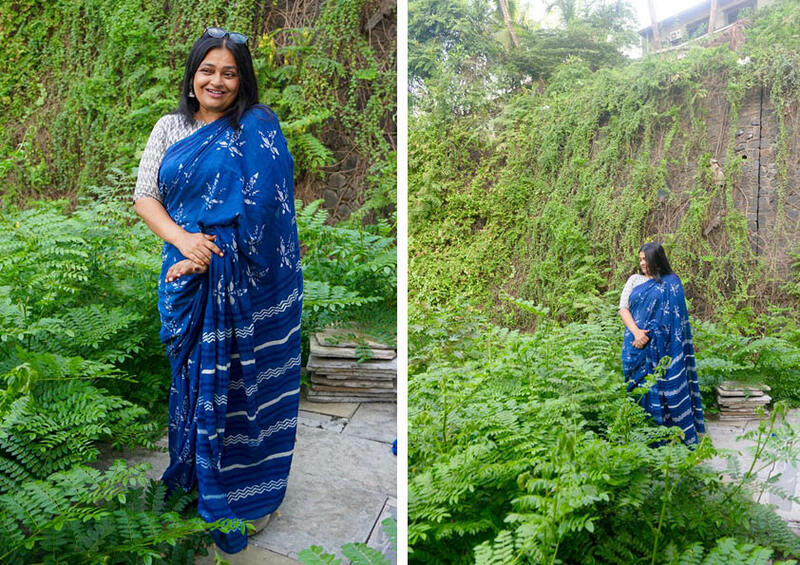 I made 15 sarees and I asked a friend to model them on my terrace. We started the Facebook page and I was very clear I wanted to sell online only. This allows me to travel to different places and develop cloth and not worry about a shop. I have a team now that runs the place, so I don’t have to be there physically to sell anything. And the possibility of selling sarees all over the planet is higher online. How did you come up with the name Queen of Hearts? I had left the other business I was doing before this and was sitting at home thinking about what next. I told my daughter that I miss cloth, I love to work with cloth and fabrics. She suggested that I should make sarees. I was in a dilemma then, wondering how I would run my household. I am a single mom. I have two kids and two dogs and three cats and I am sitting there wondering what to do. I like to play cards. I like to play solitaire. For 1.5 months I was just playing solitaire, cooking for the kids, watching TV and playing more solitaire. When I am doing something monotonously, I start thinking. So I as playing solitaire, I was thinking of what my next business or profession should be. I was thinking of sarees and I kept looking at the Queen of Hearts card. I told my daughter that I would name my brand Queen of Hearts, initially she did not approve saying it sounds cheesy. But I was convinced, I like Alice In Wonderland, and everyone wants to feel like the Queen of Hearts- Dil ki Rani. You wear a saree and you feel good. I wanted a person to feel transformed in a Queen of Hearts saree. Deepa with her brother Jesal: business partner and keeper of all things in order. My background and education is in interior architecture with interdisciplinary approach. I have a Master in Fine Arts from the School of the Art Institute of Chicago and a Bachelor in Interior Design from CEPT, Ahmedabad. I have worked in places like Chicago and New York for several years as a design educator before moving back to Mumbai. Here along with interior architecture, I have worked extensively in the fields of branding design and strategy, advertising, retail point-of-sale activation and experience design for real estate. Currently, I am working as an experience designer at Godrej Properties Ltd.. My role specifically is to design the entire life style propositions of our various properties across India. Martina Spies holds a PhD in architecture, is a builder and activist. 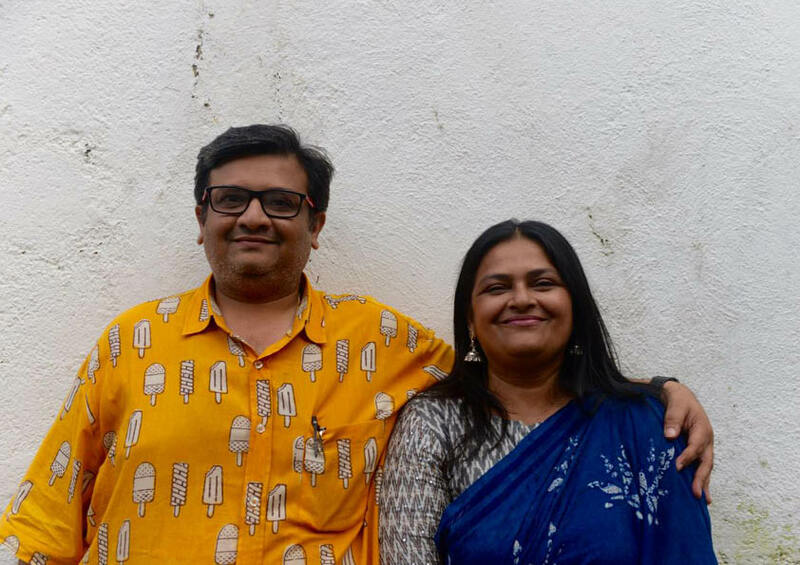 In 2013 she and her father founded the organization Anukruti, which builds playgrounds on vacant urban sites within slums in the megacity Mumbai. She has gained experience in international offices such as Shigeru Ban in Japan, COSTFORD, B.V. Doshi and Hasmukh Patel in India. 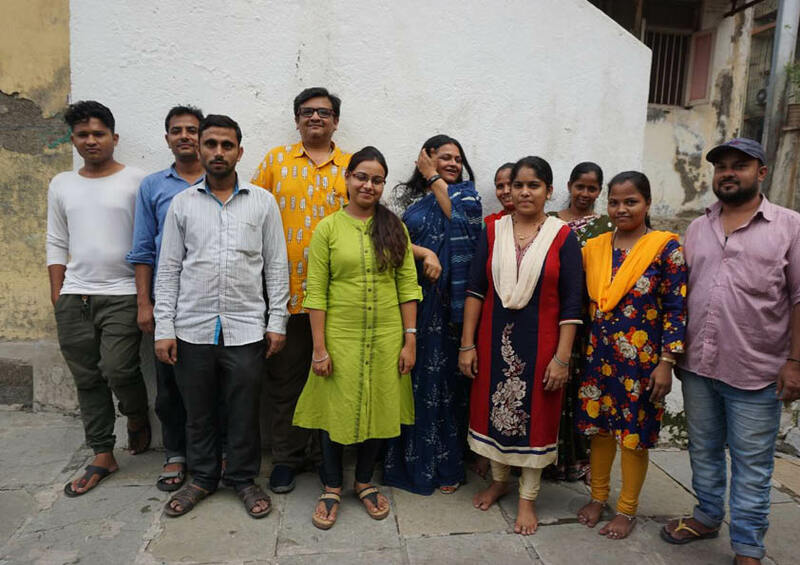 Between 2013 and 2016, she worked as a research manager for the project Ground Up – A Dwellers‘ Focused Design Tool for Upgrading Living Space’ in Dharavi, Mumbai in one of the highest density and largest informal settlements in the world. At Studio X Mumbai, Martina Spies, in cooperation with Columbia University, was the successful curator of two international exhibitions called Dharavi: Places and Identities and Mumbai – which bring the four neighbourhoods in the slum in the middle of Megacity Mumbai alive and Let‘s play! Children as Creators of Informal Playspaces, which showcased the culture of playing in India for the first time. An interactive spatial structure between art and science as part of the Weltausstellung Reformation 2017. The project is funded by r2017 e. V.